Death Sworn was one of my favorite books of 2014. I loved its romance, its action, and all of its fantasy elements! So I was super-duper excited to read the sequel. Unfortunately, I forgot that Leah Cypess’s endings are not the best—they’re actually pretty bad. I knew going into this book that Ileni wasn’t going to be hanging out with Sorin a lot, I’d just hoped they’d have time together eventually. But it didn’t happen. And I was sad. I really liked Sorin’s character. He was the type of assassin I imagine actual assassins are like. And Ileni wasn’t a strong bada$$ character, but she was growing into one. I was excited to see her growth. But once again, it never happened. There’s also some new characters thrown into the mix. One of which is a potential love interest for Ileni. The other side characters are just kind of thrown into the story and aren’t explored as much as they could be. I enjoyed the setting of the story, in the Academy. I thought that exploring the “enemy” through its magic techniques and the mountain was awesome. We were allowed to really question what was right and wrong, and really there was no black and white answer. However, this exploration of the Academy left little room (as I mentioned earlier) for romance. And romance is something I cannot do without. Additionally, I cannot do without Sorin. And that brings me to the ending (this might be kind of SPOILERY considering my last comment, so you may want to leave now), I like how things weren’t all wrapped up like they normally are in action stories that revolve around fixing societies, but I just don’t like some of the choices the characters made to get to that ending. 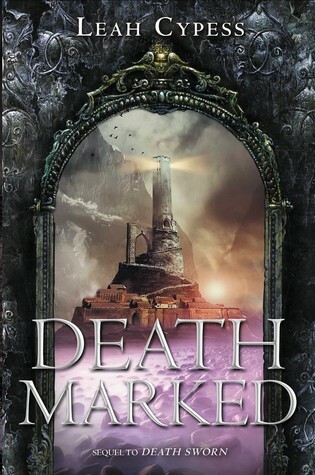 All in all, I can’t decide how much I liked Death Marked. I definitely enjoyed it less than its predecessor, but I liked it a little bit. Would I recommend it? Not if you’re looking for a fantasy book filled with romance. If you just want some magic in your life (hee hee. See what I did there? ), then I’d say go for it.